That was my first thought upon waking yesterday morning. I can’t do this. 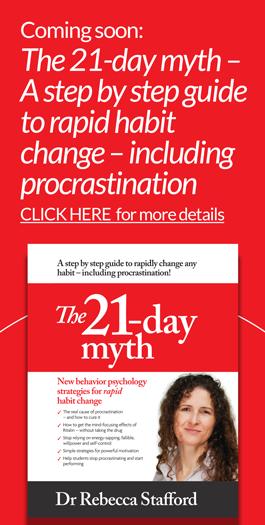 I was thinking of my book The 21-day myth: A step by step guide to rapid habit change – including procrastination. The previous morning I’d sent a book draft to my editor, followed five minutes later by a 45 minute interview with a newspaper journalist. The topic: reducing workaholism and boosting productivity. Ironic paradoxes are wonderful. I enjoyed the interview. Afterwards I was shattered. I’d gone to bed at midnight the night before, and for some months now – in classic workaholic style – I’ve been socially reclusive and working long hours on my book. It was all in a good cause. (Workaholism always is.) I was pushing towards a deadline of this Monday being the date I’d send the finished galley-copy of the book off for formatting – a precursor to publication on the 1st May. And yesterday morning I realized I simply couldn’t meet that self-imposed deadline. I’m not (consciously) going for the perfect book – the kind of book that will be criticism-proof. I’m trying to live by a mantra borrowed from the charming Naomi Dunford of IttyBiz fame that “Millions of people are waiting for this information now – not the perfect book ever”. And the book doesn’t need to be perfect – but it does need to be good. It needs to be a ‘good enough’ carrier of my psychological tools. You may know I developed a psychological toolkit to get myself from university dropout to Ph.D., and I’ve been using them to help others ever since. The tools work, but only if you use them. The book needs to be good enough to present readers with a compelling case for trying them. And yesterday morning, I realized to my despair, that there’s no way the book could be good enough by Monday. I’m feeling okay now, but I’ve had to resolve some emotional and practical book-issues. Emotionally I’m embarrassed. I’ve set and missed a number of deadlines on this book. I worry you’ll ignore any further book publication deadlines I advertise, and worse – think I’m a fraud. Fair question. But the thing is, if you never struggle with habit change or procrastination, you don’t need my book. If you do struggle with these things then I want you to know that struggling doesn’t mean you can’t do it. While good work can be fast easy and fun; struggle and frustration with Important Projects is common. But more than that, as best-selling author Elizabeth Gilbert writes in her book Big Magic, frustration is not an interruption of our process, it is the process. Holding ourselves together through all the phases of creation is where the real work lies. So, going forward, one of several strategies I’m using to hold myself together is… no more deadlines. They are freaking me out too much. It’s not like I haven’t written stuff before. I won several short-story prizes at college, I’ve written a Master’s and Ph.D. theses, and I’ve authored and co-authored a bunch of academic journal articles. Not that they were easy, but turns out writing a popular psychology book (‘popular’ as in ‘for the public’ rather than ‘for languishing unread behind the paywall of an academic journal’) is quite a different beast and I’m right out of my comfort zone. Which is okay, I’m into trashing my comfort zones – as you can read in my article What REALLY happened at the tantra workshop. But enough with the deadlines. Going forward, I’m having undeadlines. So, practicalities. When is the undeadline for my book launch? After discussions with other people impacted by my… psychological process (my book designer, editor, and literary PR person – who, incidentally, said they thought my deadlines had been too tight), the book will probably be published early June. Maybe mid June. There are more practicalities around promotions of the former launch date. So far I’ve been interviewed about my book by three journalist. They will be telling their readers the book will be available from the 1st May. Which is no longer true. However, one way of minimizing the number of people I annoy – and to help leverage any book publicity between now and the book launch – is to have the book available for pre-order on Amazon. To quote someone else worth quoting – Ranjna Patel who founded what is now one of the largest primary providers in New Zealand and Australia – an obstacle is an opportunity. 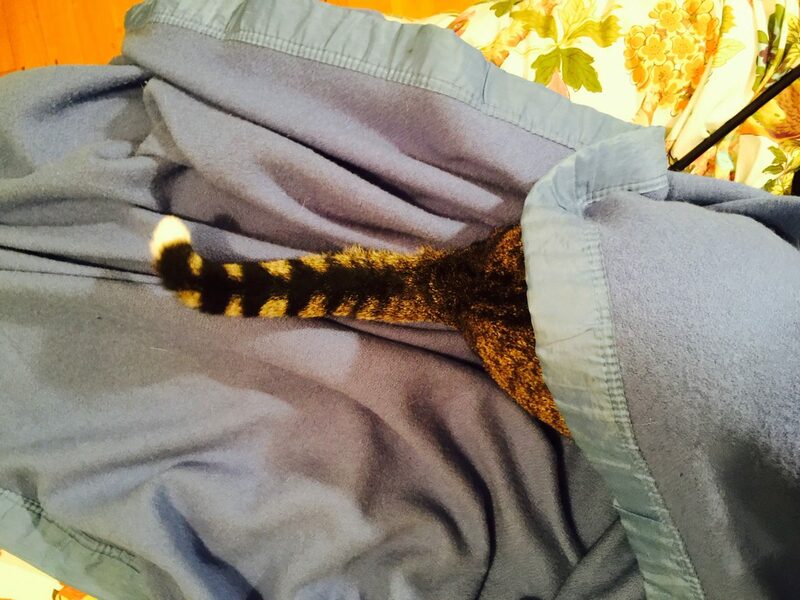 This latest delay in my book launch may be a blessing in disguise. Perspective is also helping hold me together. 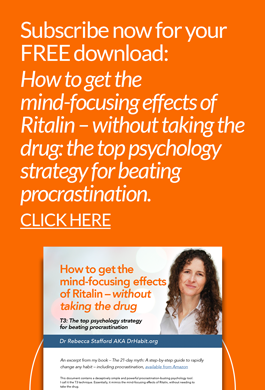 It’s taken 48 years of living and studying and practicing psychology to enable me to write this book. Another month or two shouldn’t make any difference, except for my book and I being much better for the extra time. At this point, I’d like to say something in defense of deadlines. While it’s frustrating I’ve missed so many deadlines, it’s been far from a waste. Each missed deadline brought significant progress that probably wouldn’t have otherwise happened. The deadlines, and the missing of them, was part of the process. I’ve found many people don’t like setting deadlines. The main reason is they worry they won’t meet the deadline. This is a form of protective self-sabotage. The sub-text of self-sabotage is “If you don’t try you can’t fail”. And while this is true, avoidance of failure (manifested by not setting deadlines – not even undeadlines) makes it much harder to succeed. But – as I hope I’ve conveyed – when it comes to deadlines; even if you fail to meet them, you can still succeed. If you count progress as success, which I do. So, good luck to you and your own Important Projects. If it helps, consider trying undeadlines. I’d love to hear about your experiences with anything to do with deadlines, publishing, or Very Scary Projects. What helps and what doesn’t? I 99% guarantee your comments will help others. Just leave your comments at the bottom of the article. Be a hero the easy way. If you have found the contents of this article slightly useful, mildly entertaining, or just not too annoying, please consider forwarding it to your kindred spirits. Just use the social media icons floating around. Contact – Want to get in touch? Use the contact form on my blog. How to tell when your inner critic is lying through its teeth – Very topical, and in which I explain why I wish everyone would get a Ph.D.
Don’t waste this painful but useful emotion – Also very topical, how to put to good use an emotion most of us waste trying to get rid of as fast as possible. – more intracranial gems from Elizabeth Gilbert.